For the past seven years Kay has been a resident at Loch Lomond Villa. In these years Kay has grown to become a part of our family. As part of Loch Lomond Villa’s mission to be a community dedicated to breaking barriers in long term care we have the Senior’s Dream Program. This program is dedicated to fulfilling life long dreams of our residents and showing the greater Saint John community that age really is just a number. 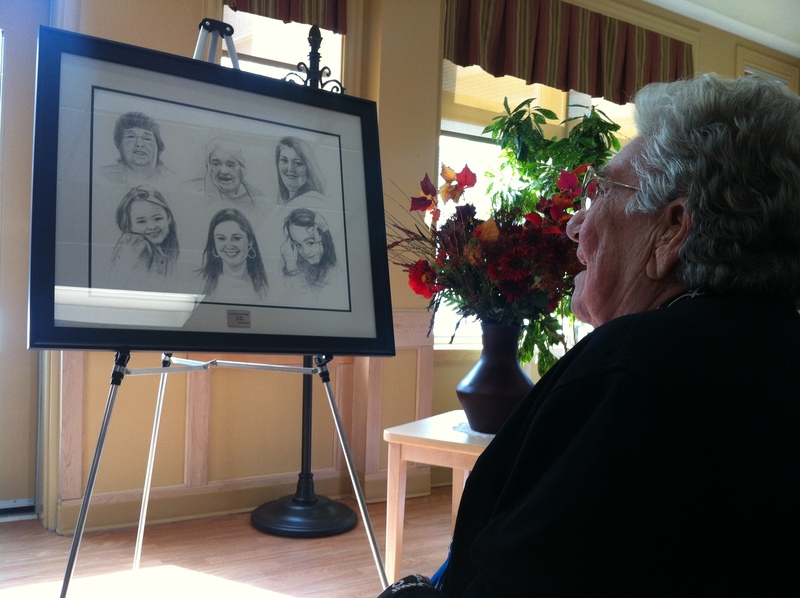 Kay was one resident who had her dream fulfilled which was to have a portrait commissioned highlighting five generations of women in her family. Having this dream fulfilled remains one of Kay’s favorite memories. She says “That was the nicest thing that has ever happened to me in my life. What made it so special was the people behind it who did all that work for me. They really cared.” Kay believes that what matters most are the people in your life. Her story truly highlights how she learned the value of family. Kay was born August 11th 1925. The 1920’s for many people was a time of social change, reinvented style, and celebration. For Kay, growing up in the 1920’s was a period where she overcame hardship. She learned the value of family and of keeping each other afloat. Kay was born the seventh of ten children to her mother and father. She spent her childhood growing up on a small farm on the Indian Reservation in Bear River, Nova Scotia. Her father served as Chief for twelve years. Kay never had a lot of money and her parents faced many challenges raising a large family. Financially things were tight, but Kay found solace in religion and good company. She would spend many days with her father learning about God and finding comfort in his words. Religion was something Kay could turn to at any time in her life. It also gave her the chance to connect with her father. Kay speaks fondly of him saying “my father was the best part of my life when I was a kid.” Time spent with her father showed Kay that the best things in life were free. When she wasn’t with her father she was with her brother Joe. He was two years older than Kay, but they were attached at the hip. They did everything together. In the summer they would go swimming and in the winter Kay would ride on Joe’s back as they skied down the hills. Growing up in the 1920’s Kay couldn’t afford to do as many things as other kids. But, because of this she grew up knowing the importance of the relationships we make in our lives. Kay’s narrative does not surround the things she has accumulated over her lifetime. Rather, it focuses on the people she has met along the way. With each person that enters Kay’s life she has shown them kindness and respect. Her friendly disposition was created by a family in the 1920’s who saw that memorable moments had more value than a dollar ever could.